It's time to get serious about removing the head! I didn't remove the exhaust manifold, as it really isn't necessary to regular head gasket replacement. Also, since the studs do not come off very easily, it is much easier to replace them on the bench than on the block. Some people also keep the intake manifold on the head. I'm not sure how they can lift the head with both intake and exhaust attached, but it can't be easy. Even with just the exhaust and cams attached, the head must weigh one hundred pounds. Let's get this started by removing the valve cover. Be very carful with your bolts and tools at this point. You don't want to drop anything down the timing chain hole! Now you need to set the engine to Top Dead Center. Removing the spark plugs will eliminate compression and make this easier! You can use the starter to move the engine a little bit at a time. Once you get close, use a screwdriver to move the flywheel to the exact position. The cams marks should be very close to the pointers. If they are way off, then you need to rotate the engine another 180 degrees. Remove the timing chain tensioner. It's the big nut underneath the A/C Bracket. If you remove the little bolt first, you will be able to measure the play in the timing chain by looking at how extended the tensioner has moved. I believe the max amount is 11mm or something. Using a wrench on the cam and a wrench on the sprocket, remove the bolts on the chain sprockets. Be very careful not to drop the bolts down the engine! Wrap a coat hanger around the timing chain so that you can fish the chain out of the engine if it falls in! Now take your E-16 torx socket and loosen the head bolts 1/4 turn in the same sequence as tightening them. This sequence can be found in the Bentley manual. The bolts should still be somewhat tight at this point. Now go back through the same sequence and remove all of the bolts. In the Bentley book it says to place a dowel or special tool back into the head. This is so you can lift the head straight up. This is not required, but it does really make it easier to pull and drop the head on the engine. The head will be stuck on the engine pretty good. You need to pry it off and then lift it up. This is much easier with a helper. One person pulls the head while the other prys it. Lifting it off of the engine is also easier with a helper. There are 2 pins that the head sits on. You must lift the head straight up and clear both of these pins. 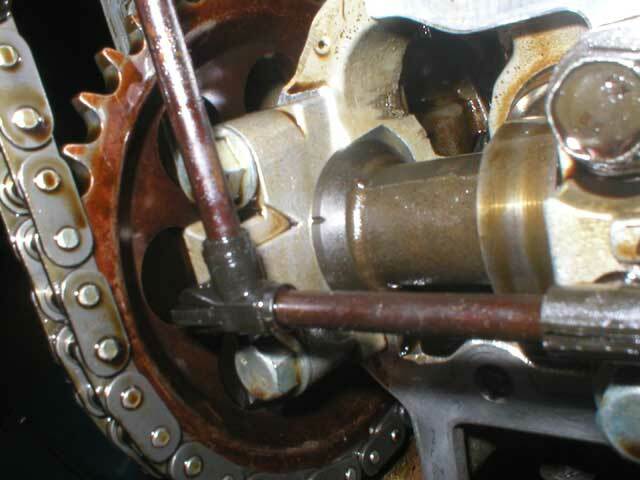 The timing chain can simply be moved through the head and rest on the engine while lifting the head. Since you have the coat hanger wrapped around the chain, the chance of losing the chain in the engine is very low. If you didn't unscrew the big coolant drain bolt in the block, the pistons will look like this picture. Clean out the cylinders with some paper towels. 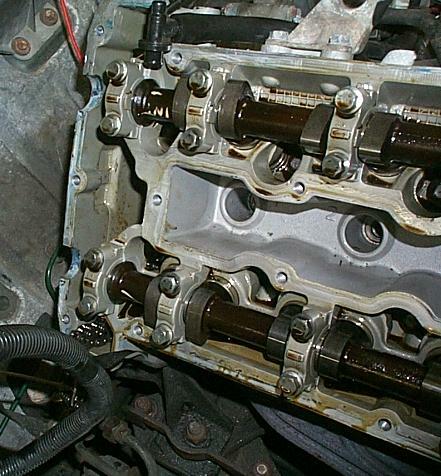 If you're going to leave the head off of the engine for a day or more, rub the 2-3 cylinder walls with motor oil to keep them from rusting. At this point you are ready for another beer while you analyze your engine and head. Look at the gasket and try to find the failure. 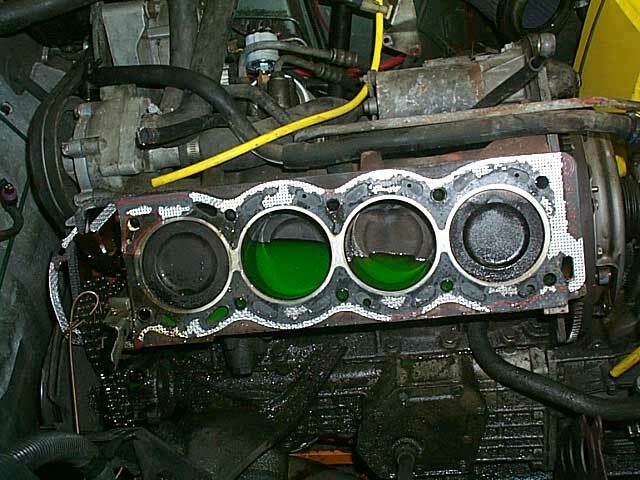 If the gasket was leaking coolant into a cylinder, you should have one very shiny piston. Clean the dome with brake cleaner and look for small cracks between the valves. This is the most common place for cracks. Check your pistons for cracks or dents. If you had a valve hit the piston, the piston may need to be replaced! Now it's time for installing the new gasket and re-assembly.